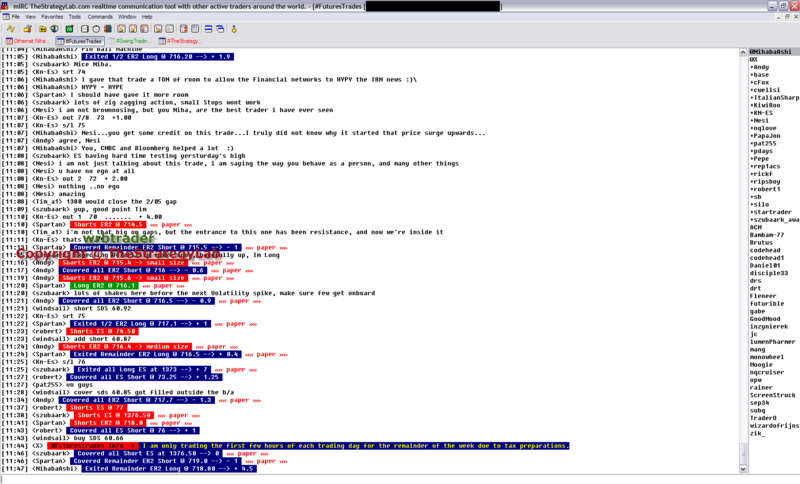 All screenshots above were taken during screen sharing with many members of the free chat room. Your reading this web page because your considering joining a top real-time trade posting chat room that's FREE and open 24hrs a day where members are posting their real-time trades, posting WRB Analysis and/or discussing the price action of their trading instruments in a well moderated environment (we keep the peace between members). Simply, you'll get real-time market analysis involving WRB Analysis and be among the action of a diverse group of traders that uses different trading methods with WRB Analysis along with seeing what some of the veteran profitable traders are doing during the trading day...entries, exits, position size, market analysis and an occasional trading tip. ##TheStrategyLab chat room is well moderated to keep the peace between members and to prevent problematic traders, spammers and trolls from using the chat room. 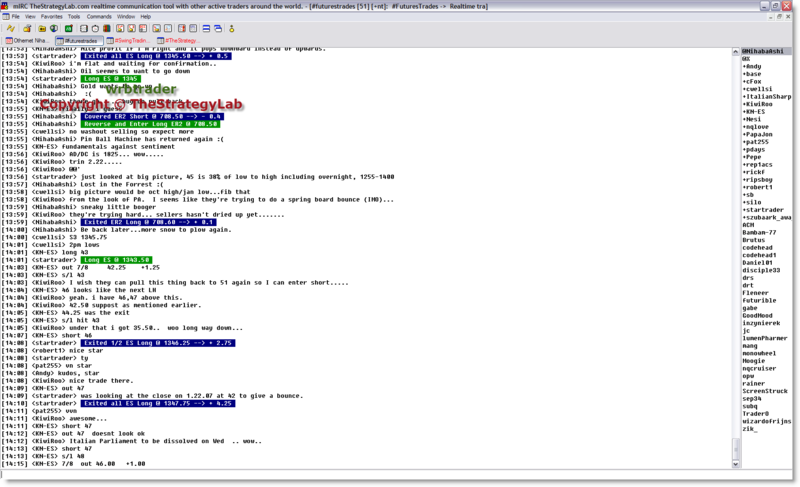 By the way, #FuturesTrades chat room is now called ##TheStrategyLab chat room. ##TheStrategyLab is not a signal calling trade room nor are there any head traders, gurus or anyone to tell you what to trade, when to buy or when to sell even though members are posting real-time trades. 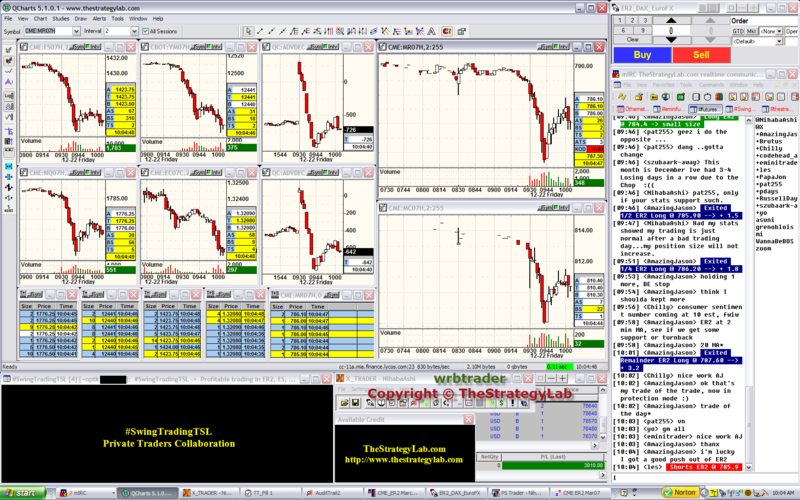 ##TheStrategyLab is designed for traders (that's you) to document their own trades and thoughts while using WRB Analysis as they traverse from one trade to the next trade because it provides critical information about their trading day that they cannot get from their broker statements (real money or simulator) nor from back test results. 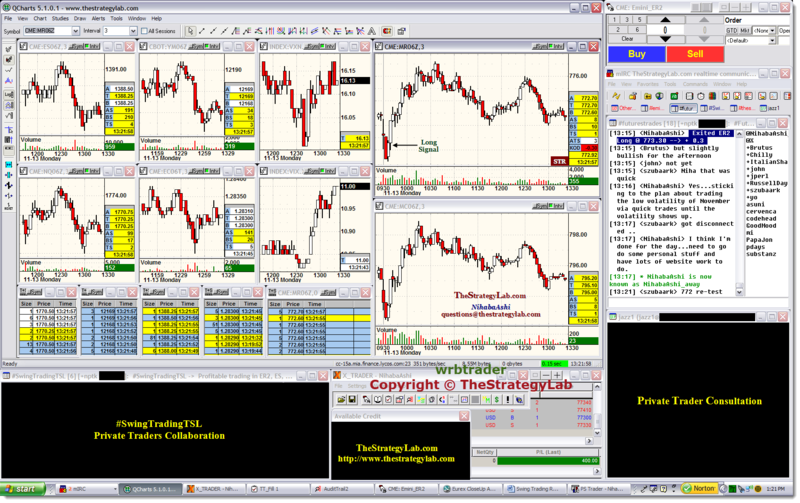 ##TheStrategyLab is primarily designed for you to use as your trade journal documentation of each trading day along with providing an archive log for studying at a later date to help with improving your understanding of the price action (market context) and to help resolve trading problems that may cause a drawdown period (consistent losses) via incorporating WRB Analysis into a trader's trade methods because brokerage statements alone can not do that (documenting your observations about the markets from trade to trade) for you. Trolls should notice that we call ourselves a "chat room" and not a "trade room" that has a head trader telling other members what to trade, when to buy and when to sell. Also, if you send us any emails to questions@thestrategylab.com or wrbtrader@gmail.com, we are using an extensive anti-spam program that will prompt you to verify your email address prior to allowing your email to reach us. Further, if you've already been banned once from our website, forum or chat room...you then send us an email after being banned...we will not receive that email. 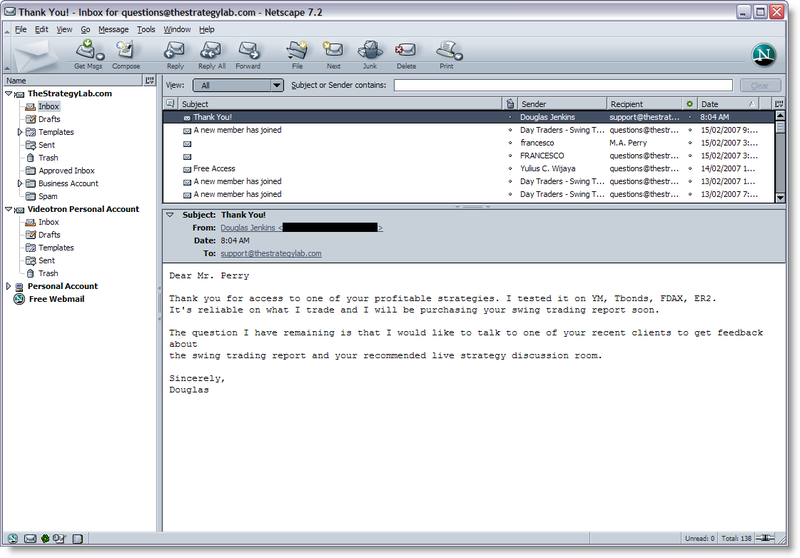 In addition, if you're using a spam filter...ensure that it is able to accept emails from questions@thestrategylab.com or wrbtrader@gmail.com so that we can send you emails. Traders using our chat room tend to be from Argentina, Australia, Belgium, Brazil, Canada, Denmark, France, Germany, Greece, Hong Kong (China), Israel, Italy, Japan, Mexico, Portugal, Puerto Rico (U.S.), Saudi Arabia, Singapore, Spain, United States and Venezuela. 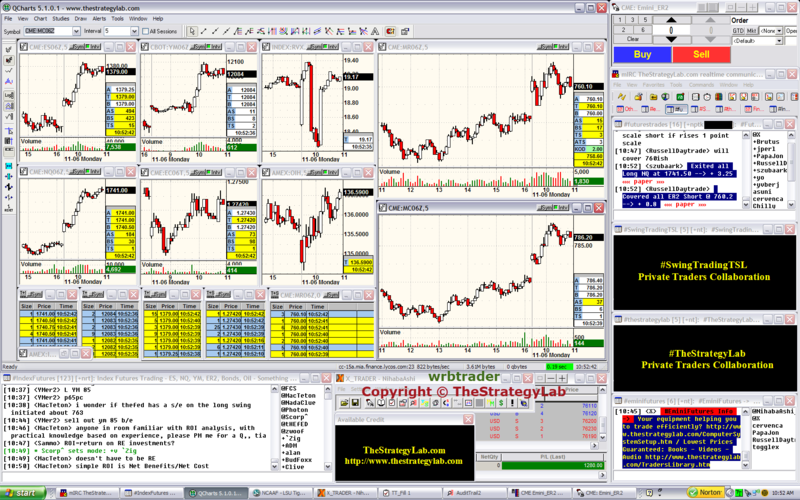 If you have any questions about our chat room, advance wrb analysis or trade signal strategies...please contact us.